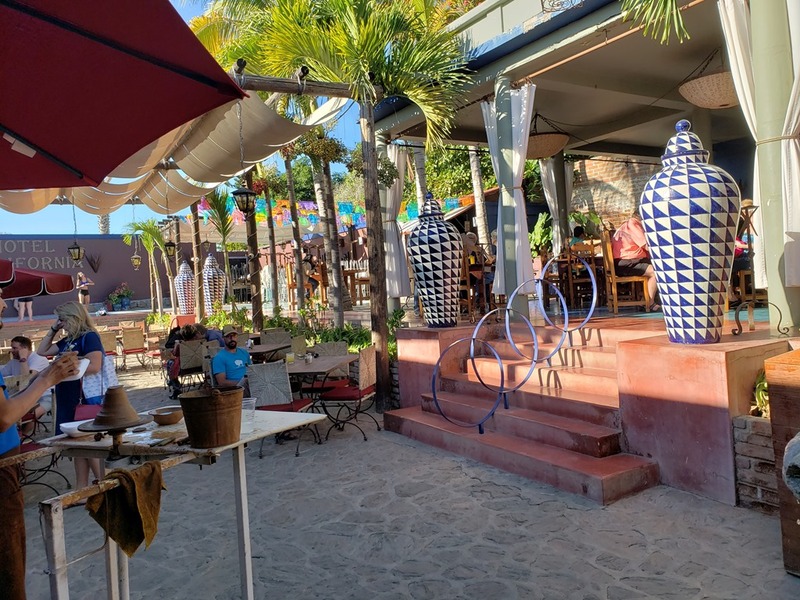 We’ve been to Los Cabos Mexico before, mostly in the party town of Cabo San Lucas and in and above the water; swimming, snorkeling, scuba diving and game fishing. 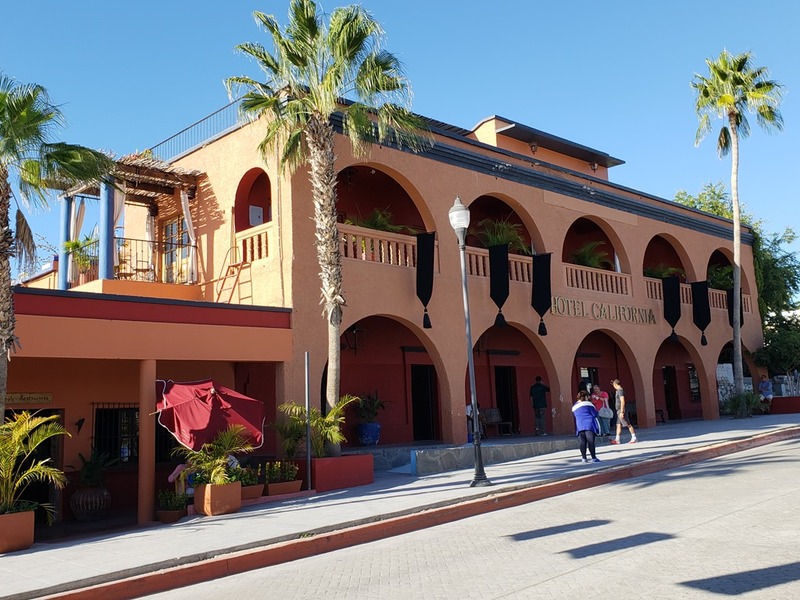 This time we spent most of our time in San Jose del Cabos, the smaller, more sedate sister town of San Lucas. 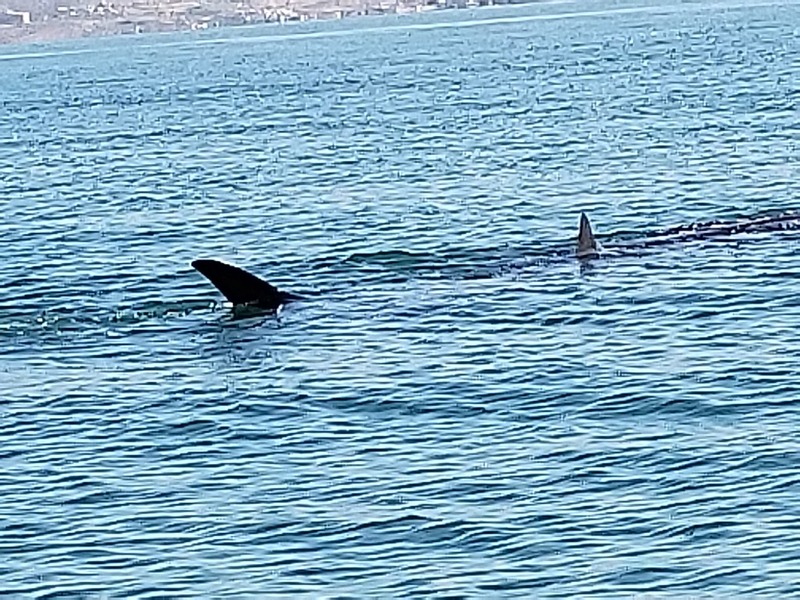 Our trip was motivated not by either of the towns, but instead by a unique ability to cavort with one of nature’s many wonders: sharks that are the size of a bus! One cannot just go out and snorkel with these gentle giant sharks. To protect them, you must go out with a licensed tour. We choose to use Baja Charters. While it was the most expensive option we found, we liked the quality of its facilities, the limited number of passengers (maximum of 16 per cruise) and the reviews it had received. We left the harbor for a roughly one-hour cruise out to the whale shark feeding grounds. During this voyage, we met our fellow snorkelers and got a rather cursory briefing from a marine biologist guide who described the largest of all fish species and described the lifecycle of these filter-feeding plankton eaters. 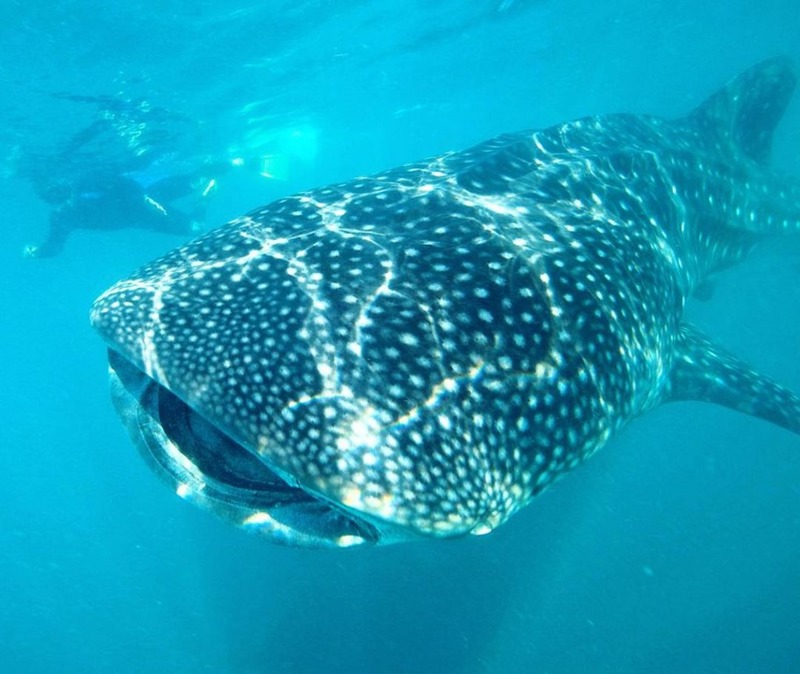 While whale sharks are only 18-24-inches at birth, the fish spend several years in the shallow, sheltered, plankton-rich bays such as the Sea of Cortez’s Bay of La Paz. They typically winter in these waters where they feed and grow up to about 30-feet in length before leaving these nurseries for deeper seas where they may live up to 100 years and grow to 40 feet in length and a weight of almost 50,000 pounds! They feed along the surface, either actively (by slowly swimming just beneath the surface with their giant, wide-open mouths taking in vast quantities of plankton, water and whatever else happens to be in front of them) or passively (by hanging vertically in the water with their open mouths at the surface, pulling in whatever happens to float by). When we approached the grounds, we divided up into smaller launches with eight snorkelers (plus a driver and a guide) per boat for the short trip to the feeding grounds where we caught our first glimpses of pectoral fins and tails above the waterline and, just below the surface, their huge bodies. 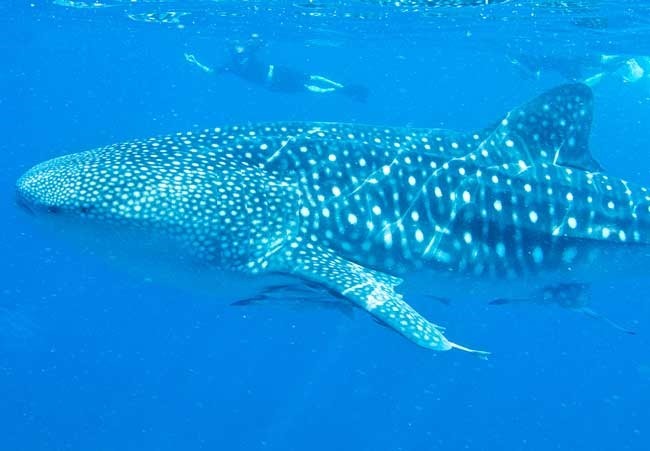 We entered the water four snorkelers (plus a guide) at a time, swimming alongside feeding giants, propelled by their powerful tails and guided by their large pectoral fins. Since the water was so dense with plankton, visibility was limited. We did, however, get close enough to see clearly—the huge mouths, the powerful but graceful bodies, the gentle movement of their tails. We each had several encounters of roughly ten minutes apiece. An awesome spectacle. We then returned to the catamaran where we showered on board, had a delicious lunch of chips and guacamole, DYI tacos (beef or chicken with all the fixins), salad and bottomless margaritas or virtually any other drink we wanted. When we returned to the van, the real partying began: any drinks we brought from the boat, a bottle of vodka (plus a variety of mixers) and concert-volume classic rock tunes (from artists including the Stones, Queen, Deep Purple, Hendrix, Doors and, of course, the Eagles’ Hotel California) in preparation for our arrival in Todos Santos, the home of the hotel that graces the album’s cover. 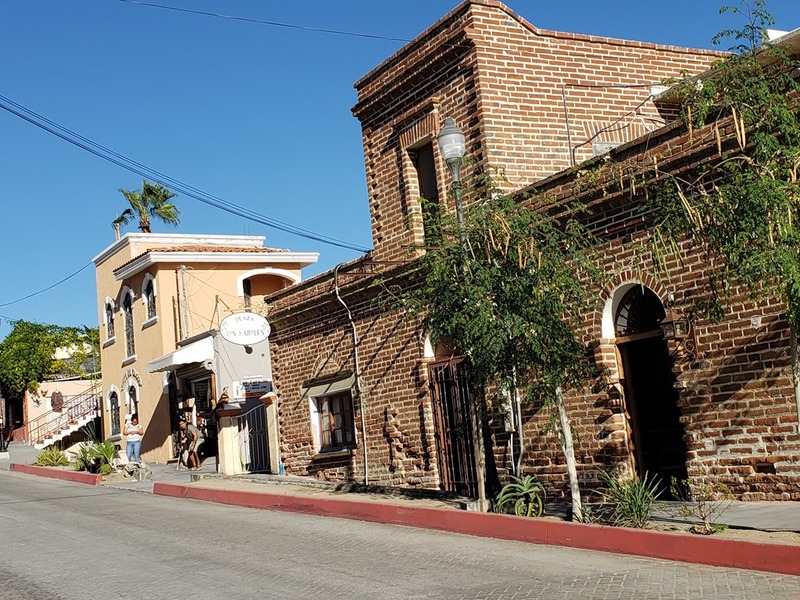 Todos Santos is a tiny town that appears to owe its livelihood to the song Hotel California. The small, otherwise non-descript hotel has been greatly expanded to include a large restaurant and bar and an equally large souvenir shop. Most of the rest of the small central town consists of more restaurants, bars and craft shops. And all of this due to the cover image for a song that The Eagles wrote. In fact, the song doesn’t really refer to a hotel at all—it is a metaphor for the celebrity rock band culture. 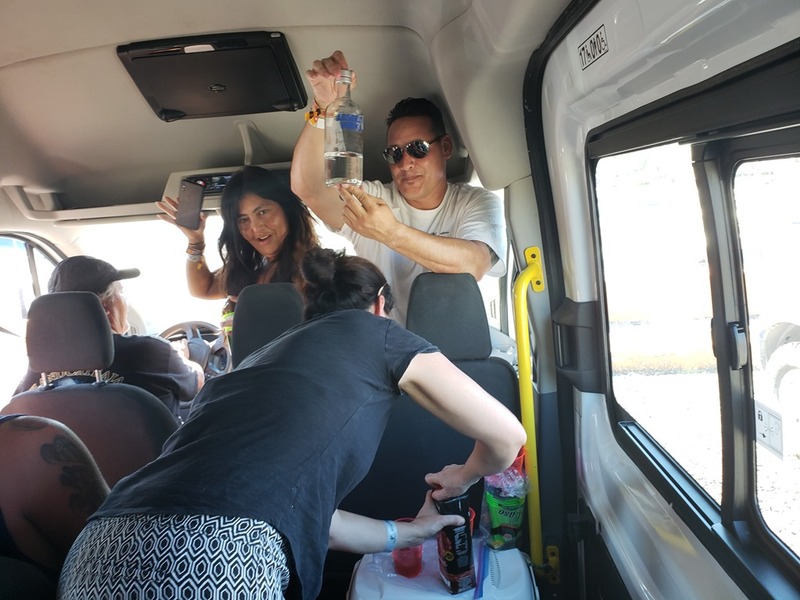 From there, the party continued for the return trip to Los Cabos. As for the tour, the time with the whale sharks was magical, the boat was lovely, the food and service good and the drinks free-flowing. But for a price of about $700 per couple? A bit steep. After snorkeling with whale sharks, any more snorkeling was under-whelming. Still, we briefly snorkeling at the Playa Santa Maria. This rocky sand beach drops off into a series of rocky canyons, many teaming with a wide range of fish, from tiny, brightly colored tropical reef fish to larger fish, such as snapper. The rocky ledges also host a range coral. While most is of muted colors, some are quite pretty. While the left (eastern) edge of the beach offers some lovely snorkeling, the right (west) was so churned up when we were there as to have virtually no visibility.